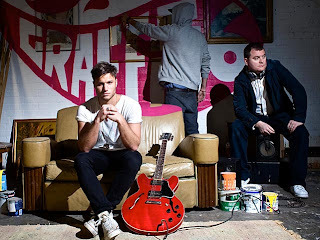 Video: Graffiti6 - "Stare into the Sun"
Graffiti6 is a upcoming pop/rock band from London, only founded in 2008. Comprised of writer/producer/DJ TommyD and singer/songwriter Jamie Scott, they had worked on other musical endeavors, but made a collection of songs together. Those songs would be used in an ad campaign, which gave them a lot of exposure. They decided to work together more and released their music on their own label. Blending pop, dance, rock and some distorted vocals makes "Stare into the Sun" a catchy tune. The video is like a party scene. People in funny animal costumes and just some goofy background things happening. The video fits the song perfect and makes it even more entertaining. Watch Graffiti6's video below.